What side is Donald Trump on? Russia’s side, obviously. But what side is Republican Senator Lindsey Graham on? Even he doesn’t seem to know anymore, based on his latest television appearance, which saw him melting down in multiple directions at once with regard to the Trump-Russia scandal. Graham came off as dishonest, self contradictory, conspiratorial, and perhaps most eye opening of all, scared. This weekend’s release of the Carter Page FISA warrant application has made abundantly clear that the FBI was acting in good faith when it successfully asked a federal judge for permission to conduct secret surveillance of the Russia-connected Donald Trump campaign adviser. Even some of the most hyper-partisan Republicans in Congress, including Trey Gowdy, are fully defending the FBI on this matter. But don’t tell that to Lindsey Graham, who appeared on Face The Nation on Sunday morning to argue that the warrant application was “garbage” and unjustified. Then things got weird. 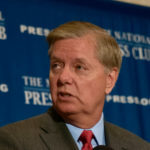 Why does Lindsey Graham suddenly have a vested interest in defending alleged Russian asset Carter Page, before the results of the FBI’s investigation into Page are even known? Just as we were pondering this question, Graham tried to play the other side by acknowledging that Russia did in fact meddle in the election. Then he listed off the Democratic Party entities who were hacked by the Russians, and insisted that the Republicans could get hacked next. Graham seemed almost frantic in trying to make this argument. Back in late 2016, Lindsey Graham publicly acknowledged that his own emails had been hacked during the 2016 election. Those emails were never released. It’s led to questions about whether Russia may have hacked his emails while he was running for president against Donald Trump, and whether Russia may now be using those emails to blackmail him. In early 2018, Graham uncharacteristically did Vladimir Putin’s bidding by attempting to get criminal charges brought against those behind the Trump-Russia dossier. Whose side is Graham on?